Over the past couple of months, I've had a couple of posts about Penn alumni getting married to one another. After the jump, check out 2 more alumni getting married and their very cool customized "Penngagement" cake. On the above cake, we see a Kappa Alpha Theta and Penn Rugby crest. Nice personal touches. 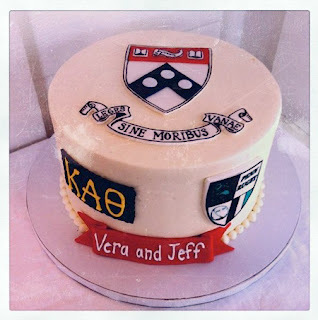 And speaking of Penn cakes, remember this Penn graduation cake?